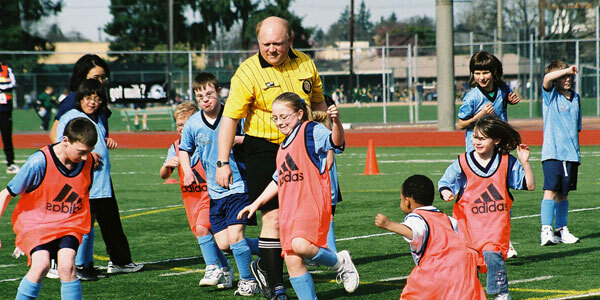 It's a unanimous refrain when you talk to anyone involved with the TOPSoccer program — there's just something different about it. Something that makes every day, every goal, every kick — even just every smile — that much more special. TOPSoccer, The Outreach Program for Soccer, is a US Youth Soccer program that teaches the game of soccer to kids age four and older with physical and developmental disabilities. Players are paired with volunteer mentors, or buddies, and given the opportunity to develop their skills and build relationships in a positive, supportive and non-competitive environment. In August, individuals from around the state will have the opportunity to participate in the Washington Youth Soccer TOPSoccer Coaching Summit, an annual event bringing together coaches, volunteers and club and league administrators to learn more about TOPSoccer, its benefits, and the specific needs of TOPSoccer players. This year's summit, being held in Spokane, will take place Aug. 2 from 8 a.m.-5 p.m. The cost to attend is $35, and includes event materials, TOPSoccer certification, a t-shirt and lunch. Topics will include safety, risk maangement, working with TOPSoccer players, US Youth Soccer TOPSoccer certification, interactive lessons, and a field session. In addition, coaches traveling from more than 100 miles away can receive one night free in an area hotel (see registration page for details). Coaches who have attended previous TOPSoccer summits rave about the unique insights gained into the most effective ways to coach and connect with TOPSoccer players, and the chance to build relationships with other TOPSoccer coaches and administrators throughout the state, for sharing advice, asking questions, or learning new and innovative coaching techniques. In addition, the summit provides an excellent chance for Club or Association leaders interested in starting a program to learn more about TOPSoccer, and the most effective strategies for launching a successful program. To register for the TOPSoccer Coaching Summit, please visit http://wys.affinitysoccer.com/eventmanager/public/event.asp?calid=6654659. If there are any questions, please contact Kim Calkins at kimberlyc@WashingtonYouthSoccer.org.